TNS Cosmetics takes care of my hands from more than a year now and is a brand in which I totally trust for the high quality; during the holidays they kindly sent 2 of their flagship products to me: the Flash top coat and the BB Nail. Flash is a fantastic top coat that dries the nail lacquer very quickly, giving a nice gel effect and a long lasting formula. It's easy to remove and could be applied again in the following days to refresh the shine and the color of the nail polish. I like to use it together with my TNS nail lacquers: this combo is just perfect, my nails appear professionally done, like in a beauty center. BB Nail is a new product to me but is soon became my favorite. It's a nail care and makeup base coat that works as base or as nail polish, giving a beautiful and classy pink finish: the nails appear flawless without imperfections and stains. 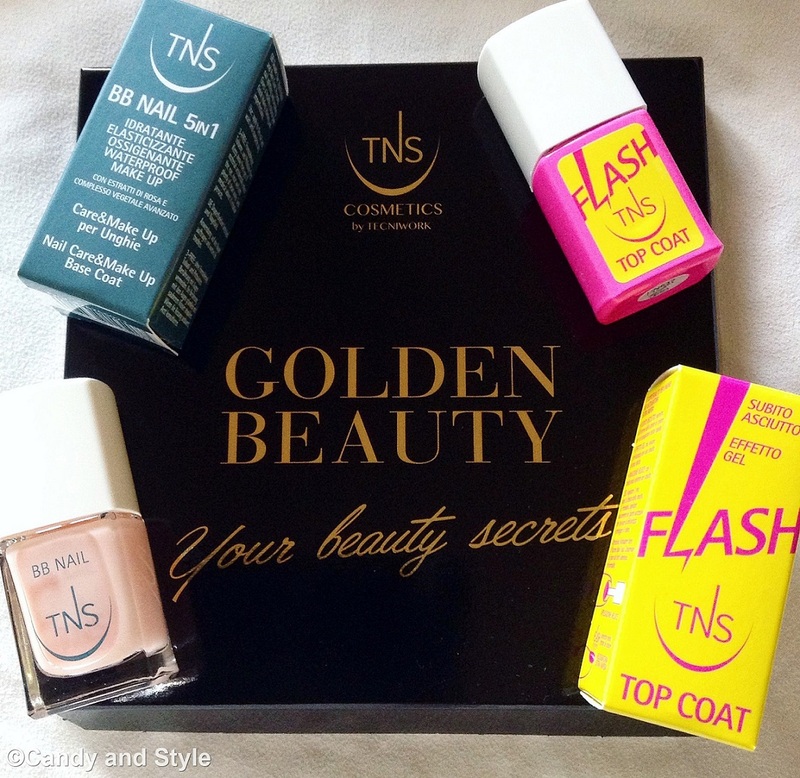 I love to use it in both ways and together with my other TNS nail polishes and top coat. ITALIAN READERS: Tutti i prodotti TNS Cosmetics by Tecniwork sono disponibili nei migliori centri estetici. Per ulteriori informazioni consultate la pagina Facebook. Lilli lo sai che ho provato lo smalto rosso che davano con il libro? è stato un regalo di Natale, è davvero un bellissimo colore e poi ha una buona durata, quindi immagino che anche questi siano ottimi! Non li ho ancora provati... dovrò farlo!!! Very nice products Lilli. The colour is so pretty. Il sogno di un'asciugatura super-rapida ci accomuna un po' tutte e mi piacerebbe molto provare anche quella BB per unghie! Non conoscevo questi prodotti... sembrano ottimi!! TNS is taking really good care of your nails. The top coast sounds lovely but I'm so intrigued by the BB Nail. It's nice that it provides nail care and can be worn alone or under polish. I wish this brand was available in the US! I have seen a few BB nail polish but never purchase one for myself. Maybe I should, eh? Lord knows my nails need all the help they can get. Would have been great to see the results of these products because they sound great! Ne ho sempre sentito parlare ma non ho mai provato questi smalti. It is the first time I hear on a BB nail, I dont know the TNS brand but I taste that works for you. Kisses. Ciso Lilly, non ho mai testato questo brand..grazie per averlo segnalato! great way to star the new year with a whole new pack of great products! The colour is so, so pretty! I also would like to super congratulate you on your blog anniversary - 4 years have passed already! so glad that I have been making part of your regular readings for this long as well!you're still having a blast with it and it really shows through your posts. as for your winter stripes outfit I love everything about today's outfit; not just the great accessories and beautiful make up but I adore the fur vest with the striped dress which works really well and looks really cosy and warm- super comfy and stylish! The hat is a knckout! as for friday loves I'm dying to try this brow product from Maybelline! - it's tempting!I have never bought maybelline lipsticks here in protugal mostly because the colour range here is so limited but will sure try them after your review!I am amazed at the great effects of the coconut oil as a hair mask - also will be a first for me! loved your suggestions! Li uso regolarmente e li trovo fantastici!! I will love to see the on your and also try them out! ciao Lilli! la BB mi incuriosisce da morire! sai che mi fido tantissimo della tua opinione, quindi dovrò assolutamente mettermi alla ricerca di questi smalti! Such high praise! I can't say I've really ever been that loyal to a nail brand before. Maybe OPI. BTW I hope you had a lovely New Year Lilli and I wish you all the very best for 2016!